Cook with it, rub it in your hair for a natural shine, swish it around in your mouth to get rid of plaque, and layer it on your skin for extreme moisture. 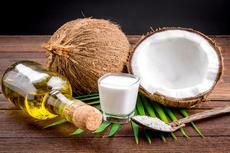 If you are looking for an anti-aging fix, look no further than coconut oil. The antioxidants in coconut oil have been shown to help protect against damaged skin, while also preventing the formation of fine lines and wrinkles.